Broad spectrum light therapy is useful for mild to moderate wrinkles. At Dr Dadu’s clinic this therapy is done as a photofacial. Photo facial is a medical facial using the properties of IPL (intense pulse light) laser which has scientifically proven collagen boosting and facial revival properties. A number of skin conditions like brown spots, sun damaged skin, facial redness and open pores and skin texture improvement and fine lines can be treated with the help of photo facial. The duration of each session and the number of sessions required depends on the patient's skin condition. Results of photo facial are quite visible and at the end of the session your skin looks rejuvenated and brighter. With subsequent sessions, skin looks younger and more nourished. 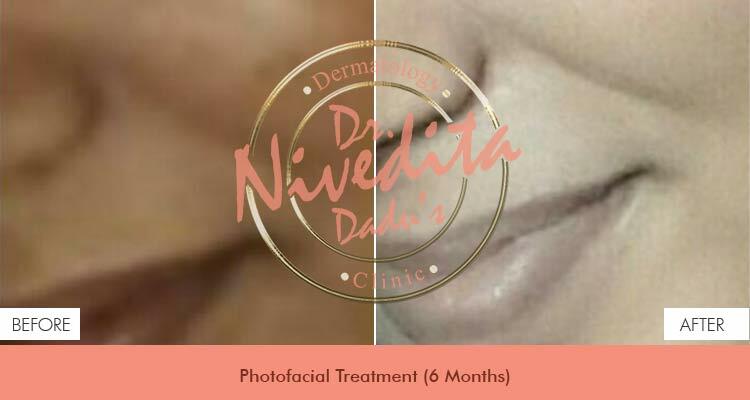 Dr. Nivedita Dadu’s Dermatology clinic has established itself as one of the most resolute laser skin clinic in Delhi providing an extensive range of laser treatment and Photofacial treatment services at an affordable cost in Rajouri Garden, West Delhi. Isn’t it incredible how Photo facial can help you do away with so many problems at once? All kind of spots that occur on face and neck can be almost treating. We use Intense pulse light on melanin or haemoglobin to naturally stop the process of dark spots on your skin. So, contact one of the top Laser skin clinics in west Delhi, Dr. Nivedita Dadu’s Dermatology clinic for all kinds of premium dermatology services at info@drniveditadadu.in. Photo facial therapy is an instantaneous treatment and doesn’t have any downtime. It doesn’t have any side effects. Within a few months of the treatment, complete results can be seen. With every sitting, the results will be better. The treatment at Dr. Nivedita Dadu’s Dermatology clinic, Laser skin clinic in West Delhi, is very effective on all skin types but it is suggested that pregnant women should not to undergo this treatment. IPL/Photofacial is a series of at least 5 treatments done at a suggested interval of 3-4 week. The wavelength, exposure, duration and energy level are chosen to specifically damage targeted skin problems without harming the surrounding tissue. The intense pulsed light energy is absorbed by damaged tissue. IPL/Photo facial intends to treat benign skin conditions to lighten, fade unwanted blood vessels, freckles, fine lines, scars, uneven skin colouring, tone and texture. At the start of the session, Dr. Nivedita will assess your skin and discuss with you, your goals and what it will take to achieve your goals. The number of treatments required for optimal skin revival depends on your goal. After treatment, you may apply makeup immediately and resume work or regular activities. It is highly recommended that you follow a comprehensive skin care program suggested by Dr. Nivedita Dadu to optimize the cosmetic improvements you obtain with your photo facial. Contraindications include pregnancy, retinoids epilepsy or those who have a history of seizures, chemo or radiation therapy, pacemaker, internal defibrillator, any internal metal device (surgical screws, pins or implants) in the area to be treated, HIV positive (a letter of clearance is required), multiple sclerosis (a letter of clearance with confirmation that the area to be treated is not numb), scleroderma, lupus, sarcoidosis, children under the age of 14, treatment over numbness of any body part, over moles or lesions of any kind, over tattoos, port wine stains, under the eyebrows, or any jaws. Skin sensitivity to IPL/ Photofacial treatments may increase by use of photosensitizing medications. Before going out in sunlight, you must protect your skin with sun block and apply it at an interval of every few hours and use a hat or light clothing (whichever appropriate) for protection. Benefits: For removal of skin blemishes (brown spots, spider veins, and skin pore size reduction). After series of treatment photofacial will make your skin brighter, clearer and smoother. Treatment: Before treatment, a gel will be applied to your skin and you will be given goggles to wear. On the treatment area, a laser hand piece will be applied to the skin and with each pulses, you will feel a “hot rubber band sensation. During treatment you might see/feel flashes of bright lights with the goggle, which is normal.